My first Valentine's Day with my boyfriend (now hubs) was slightly dreadful. Not the company of course <shifty eyes>, but it was the whole Valentine's Day experience. We had reservations at a French restaurant and when we waltzed in, we noticed that the place was chalk full of couples...wearing pink and red...and we were one of them. We were living in a cliché and frankly, I was kinda grossed out. We were squeezed into a table, side-by-side with the couple sitting next to us, and served a below average, rushed meal. We couldn't wait to get outta there. Never, never again, we told ourselves. Since then, we've done much better usually staying in for the night, avoiding pink and red in our faces. Remember Valentine's Day back in elementary school? It was definitely more acceptable to be clichéy...and there was more candy and crafts too. We had to give everyone in class a Valentine card and it was a delicate process figuring out which Valentine/candy hearts went to whom. You never want to give someone the wrong impression with a too forward candy heart ya know. For this Valentine's Day, the husband is out of town for work, but I'm luckily spending it with my girlfriends. 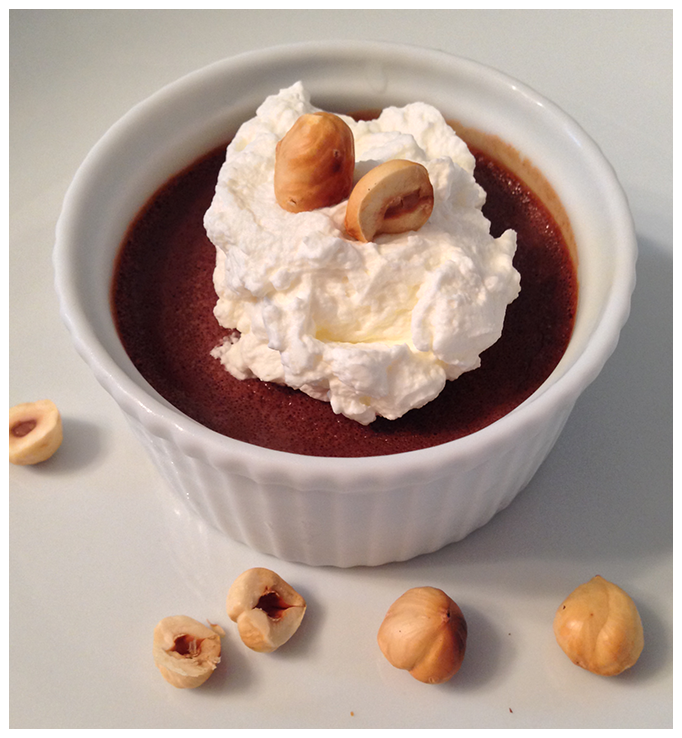 I've made us Chocolate Hazelnut Pots de Creme by the domestic goddess Martha Stewart, mostly because I'm obsessed with choco hazelnut right now and I've never made pot de creme. It should pair nicely with the RomCom I've picked out too. 3. Place 4 custard cups or ramekins (3 to 4 ounces each) in a shallow roasting pan, and divide chocolate mixture among them. Pour hot water into the pan so it reaches halfway up the sides of cups. Pro Tip(s): Line a towel on the bottom of the pan to keep the ramekins from sliding. Also, have a tea kettle ready with the hot water and pour in with the pan pulled out on the oven rack. 4. Bake until custards are almost set in centers, about 30 minutes Pro Tip: How to know when it's done? Jiggle test- grab a ramekin and hit the side, if it jiggles and then stops right away, then it's done. (custards will firm as they cool). Carefully remove cups from hot-water bath; let cool slightly. Yet another Pro Tip: Use a spatula to lift the ramekins out of the pan. The result? I was pretty happy with how it turned out. My only disappointment was that I couldn't taste the hazelnut at all. I think I'll try to work in some finely chopped hazelnuts into it next time.